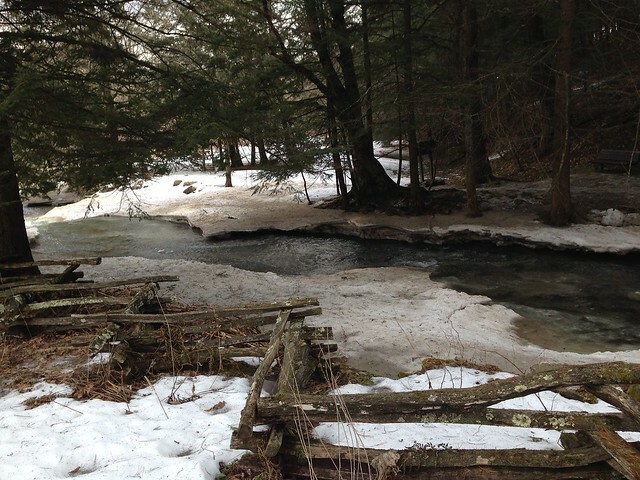 The 405-acre Salt Springs State Park is in northeastern Pennsylvania, seven miles north of Montrose in Susquehanna County. Focal points of the park are the towering old growth hemlock trees, many estimated to be more than 300 years old, and the rocky gorge cut by Fall Brook with its three waterfalls. The Friends of Salt Springs Park is a 501(c)(3) non-profit organization managed by volunteers. Operating the park through a cooperative agreement with DCNR’s Bureau of State Parks, the Friends’ mission is to preserve and improve the facilities of Salt Springs State Park,and to develop its potential for recreational, environmental,and historical education purposes. The Friends owns 437 acres adjacent to the park’s southern border, which also is open for public access. Contact the Lackawanna State Park office for facility seasons and hours. From Montrose, follow PA 29 north for six miles to the town of Franklin Forks. Turn left onto Silver Creek Road and follow for one mile to the park entrance. From New York, take NY 7 to PA 29. At Franklin Forks, turn right onto Silver Creek Road and follow for one mile to the park entrance. The Friends of Salt Springs Park offer a variety of environmental, historical, and interpretive programs year round. Through hands-on activities, guided walks, interactive workshops, and programs, participants gain an appreciation and understanding of park natural and historic resources. Programs are listed on the website of the Friends of Salt Springs State Park. Environmental education programs and historical programs can, upon request, be designed to fit individual group needs. Programs can be arranged in advance by calling the Friends’ of Salt Springs State Park office. The renovated Wheaton family homestead houses the Friends’ offices, gift shop, and historical and environmental interpretive information. Displays feature nineteenth-century rural life and regional wildlife. The Wheaton House is open on weekends from May through September.